Hi, the Linky Party is up and running over at the All that stickles blog and the Design team has made some cool projects with the Stickles of the challenge: True Blue! I made an accordion file folder out of a pretty already made folder that I bought at the Dollar store. 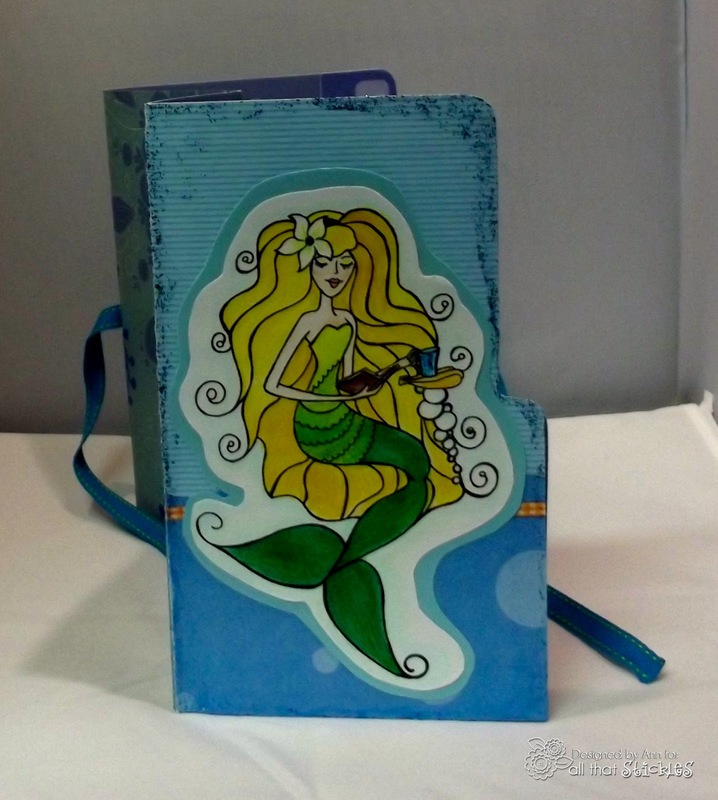 The focal image on the front cover is; Akilah a mermaid digi from Fresh Brewed Designs. I coloured her with a combination of Copic markers and a variety of coloured pencils. Of course I added sparkle to her tea cup with True Blue Stickles by Ranger! 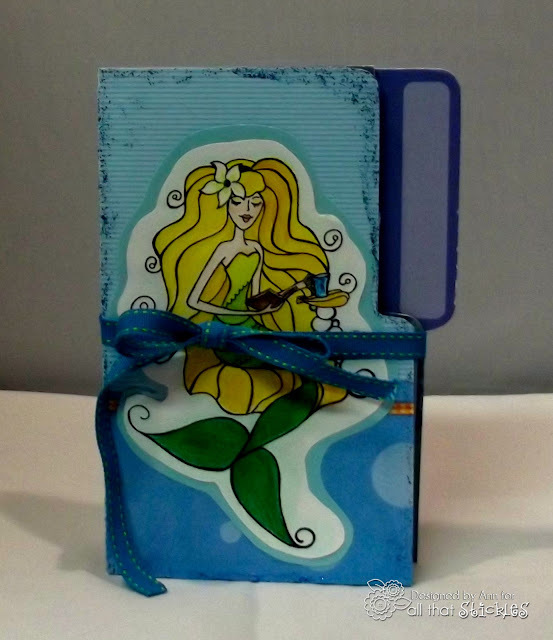 There are also some more glittery goodness around the edges of the folder and on the inside embellishments. 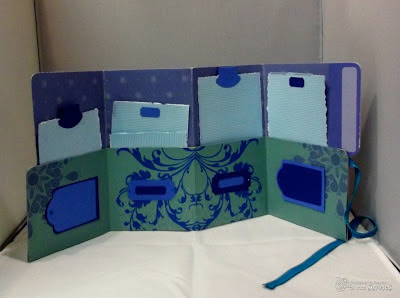 In addition to the file folder I used card stock and printed scrapbook paper to make the cover , the inserts, and the labels. The inserts above were made from scrapbook paper from the Dollar store, I just tore these with a ruler, purposely leaving the edges raw and distressed. The tabs and labels were made from a variety of blue card stock and my punches (Creative Memorie, Stampin' Up!, and EK Success). The ribbon is also from the Dollar store. These are the packages of designer file folders I found at Dollarama, each package has three different colours and designs. I will have lots of folders for many projects. To make the accordion folds I found it much easier to use a bone folder and my scoring board (Martha Stewart), although a butter knife and the edge of a table would work also. In the above picture I demonstrate some of the tools and supplies I used. I scored and folded the bottom of the folder at about four inches to make the pockets. I used double sided tape, which is also sold at the Dollar store. Note that despite what you see in this picture I ended up not adhering the ribbon along the entire back of the folder. Instead I stuck the ribbon on the two end pieces to be able to tie the folder closed. 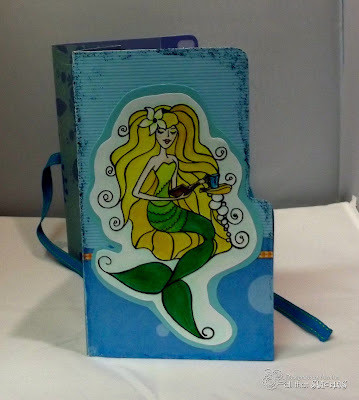 Some of the colouring tools I used on the mermaid. I hope that this gives you some inspiration for your own projects. I enjoyed making this and I hope you enjoyed viewing. Please leave a comment below, and sign up to follow me in the side bars. Don't forget you can take part in the challenge too!